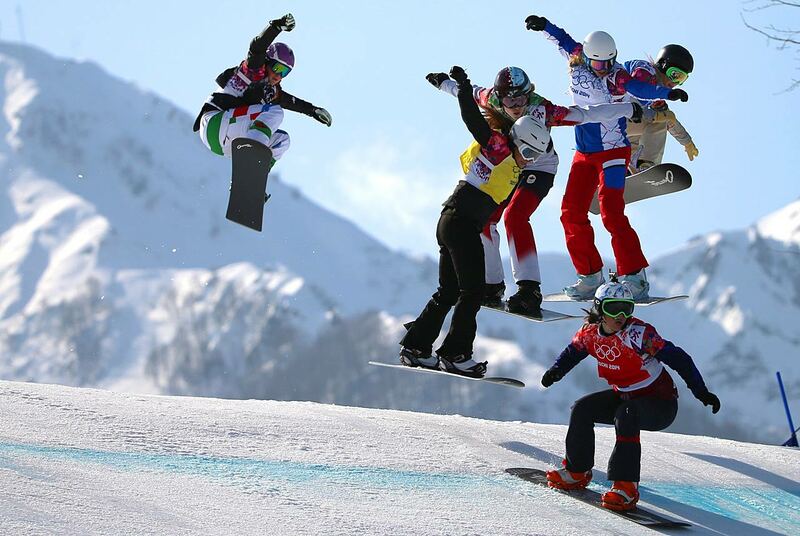 The women's snowboard cross was one of Sunday's medal events. 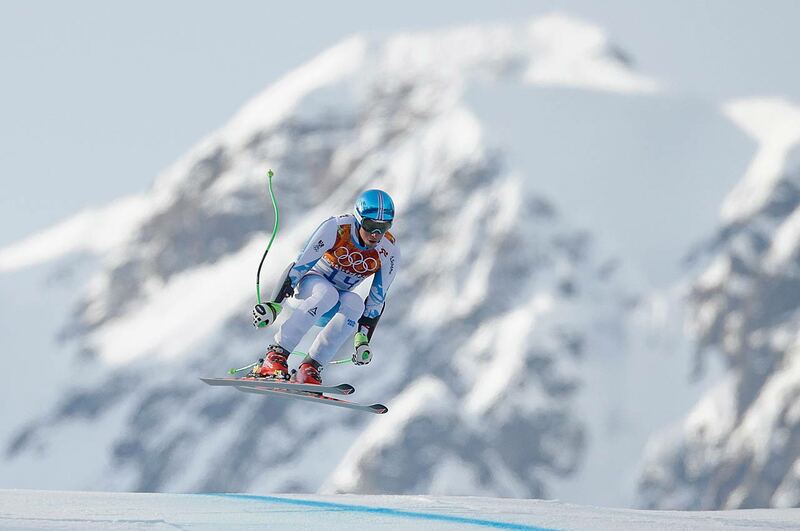 Eva Samkova of the Czech Republic won the gold. 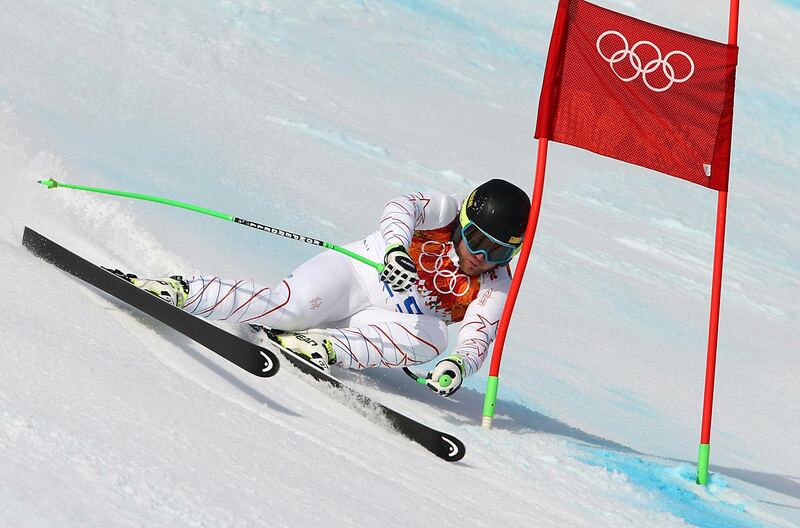 Several Olympians complained about the course because it had several spots where they were in the air for a long time. 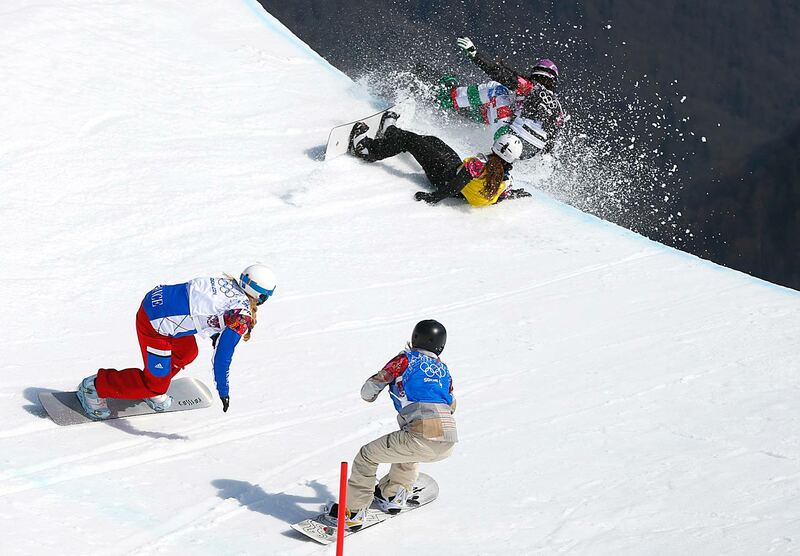 Italy's Michela Moioli, top right, and Bulgaria's Alexandra Jekova crash off a drop, as France's Chloe Trespeuch, left, and Faye Gulini of the United States follow during the women's snowboard cross final. 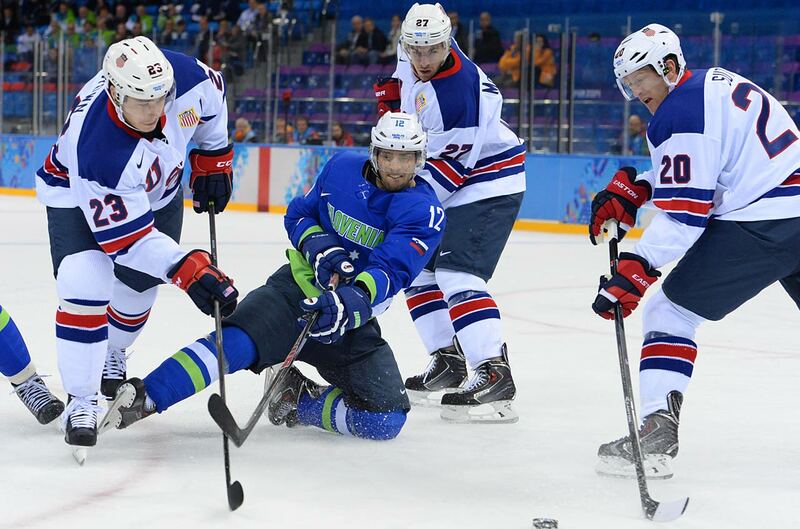 The U.S. won its final game of the group stage with a 5-1 blowout of Slovenia. 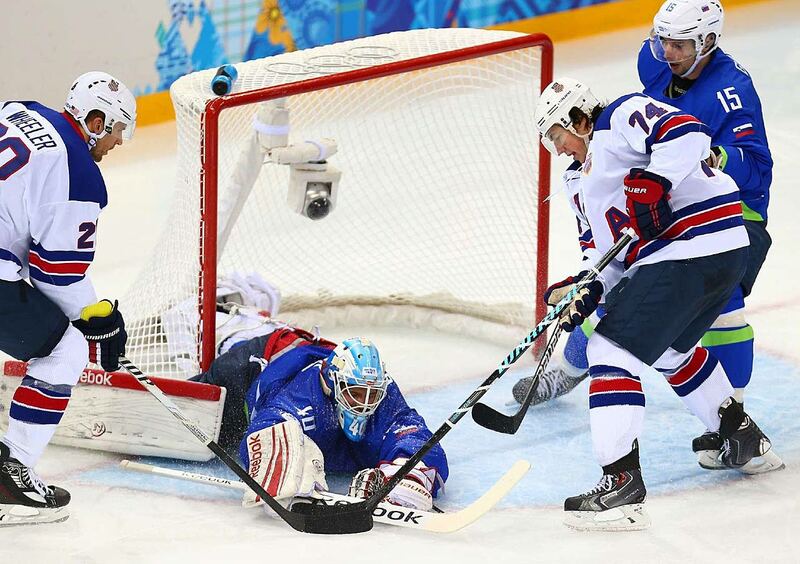 This errant shot by Jan Mursak against the U.S. sends the puck in the direction of the photographer. 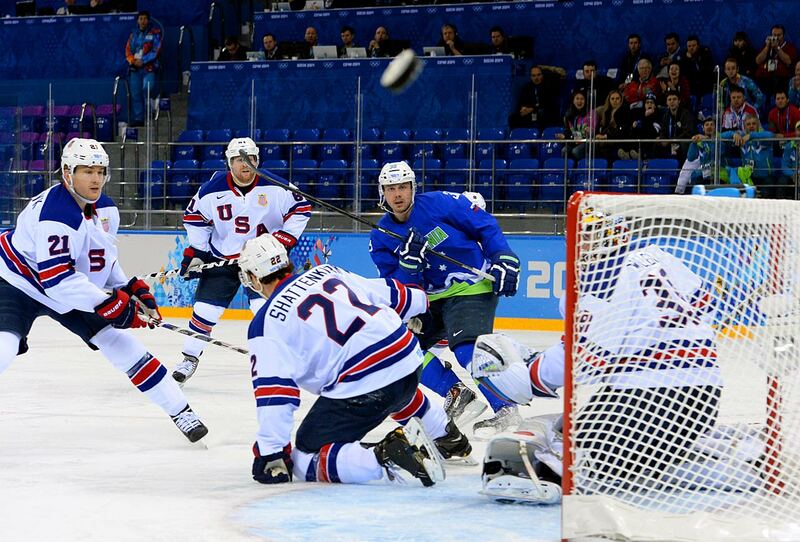 Phil Kessel had a hat trick against Slovenia, including this goal past Joe Pavelski. 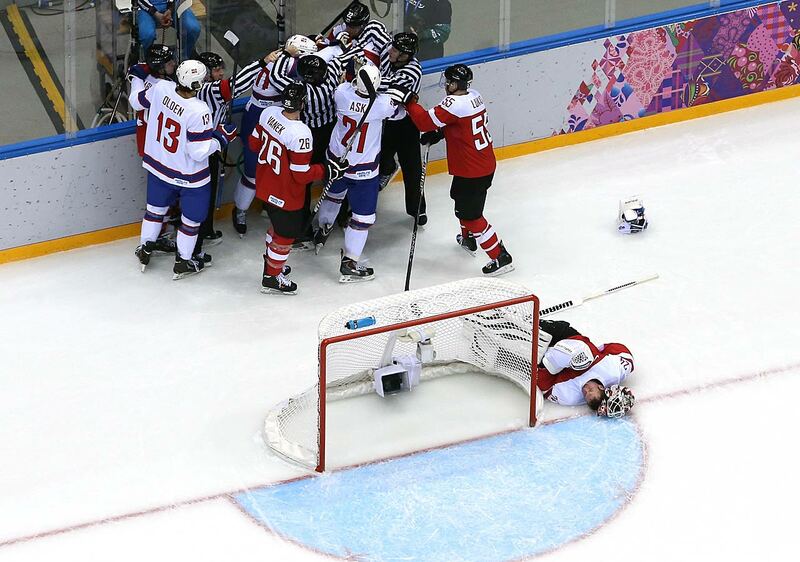 Joe Pavelski stopped this shot but it wasn't enough as the 5-1 victory by the U.S. advanced it to the quarterfinal round. 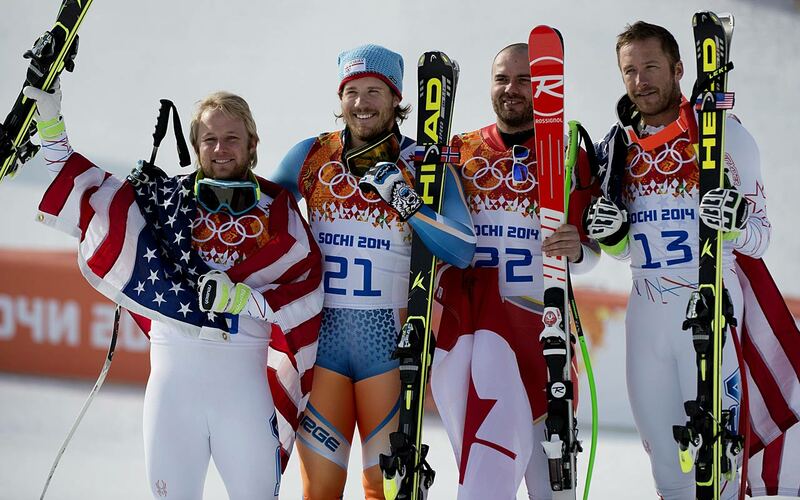 Kjetil Jansrud of Norway won his second medal at the Sochi Games by besting the field in the super-G.
Andrew Weibrecht of the U.S., a 2010 bronze medalist in the super-G, won silver in Sochi. 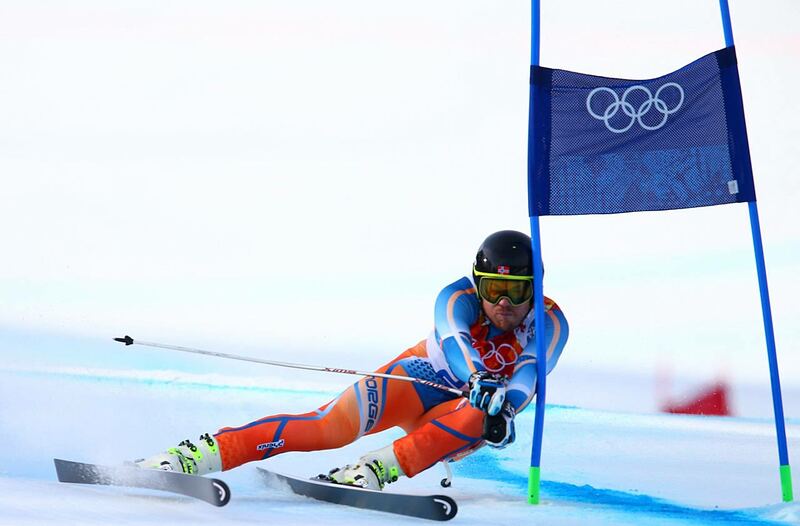 Otmar Striedinger of Austria shows some emotion after his run in the super-G. Bode and wife Morgan discuss his performance in the super-G.
Andrew Weibrecht, left, and Bode Miller, right, joined Kietil Jansrud of Norway and co-bronze medalist Jan Hudec of Canada on the podium in the super-G.
Max Franz of Austria in action during the super-G.
Mathias Lange of Austria lays on the ice after colliding with teammate Robert Lukas at the net against Ken Andre Olimb of Norway. 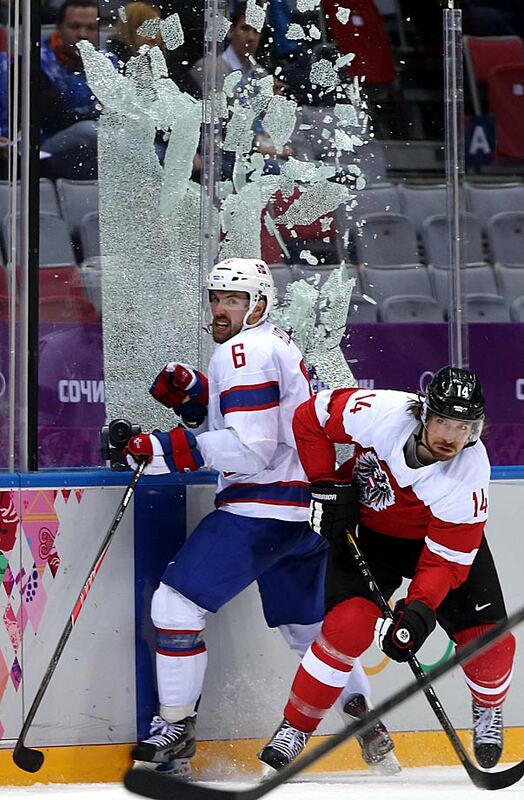 Andreas Nodl of Austria checks Jonas Holos of Norway to break the glass during Group B game. 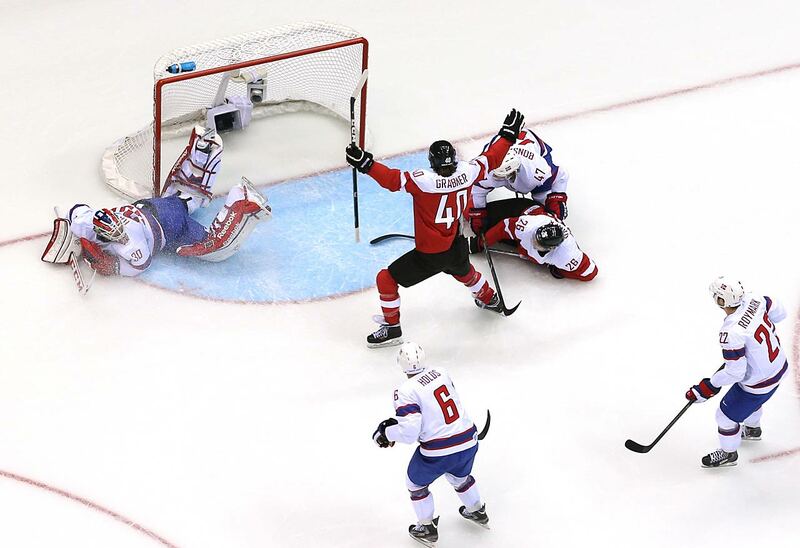 Michael Rene Grabner of Austria celebrates as he scores a goal against Lars Haugen of Norway. 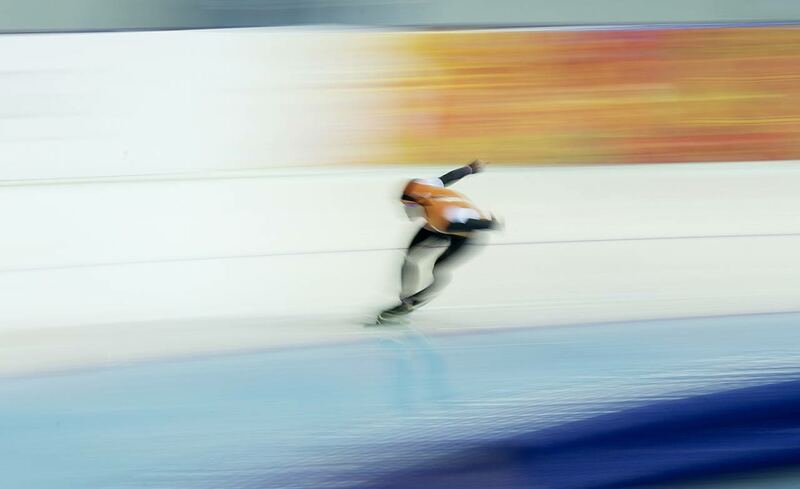 Ireen Wust of the Netherlands blazes her way to a silver medal in speed skating. 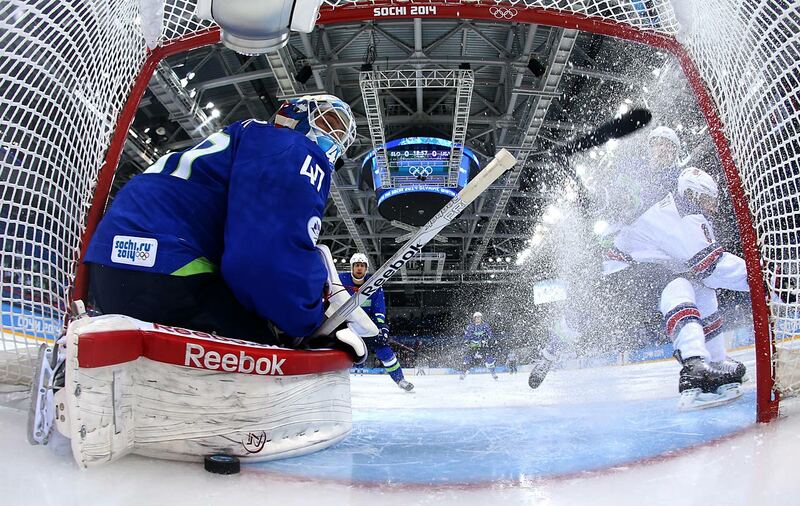 Victoria Sinitsina and Ruslan Zhaganshin of Russia compete in the short program portion of pairs figure skating. 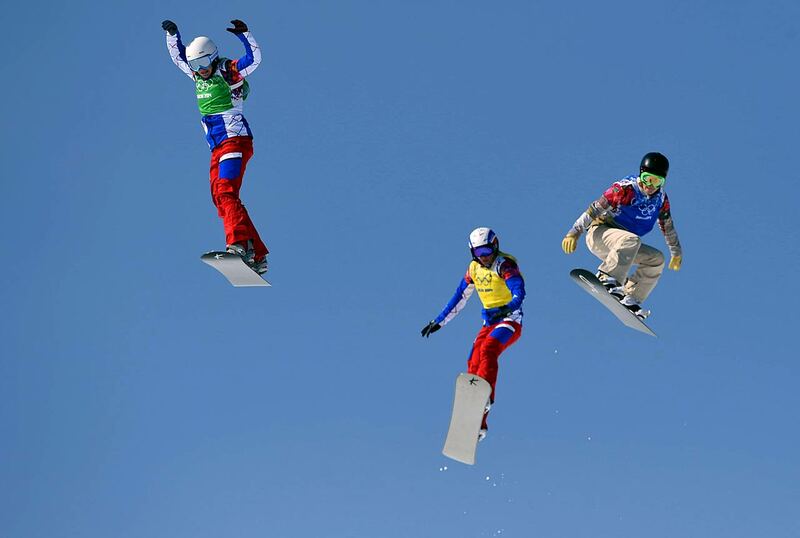 Maia Shubutani and Alex Shibutani of the U.S.
Charlene Guignard and Marco Fabbri of Itay. 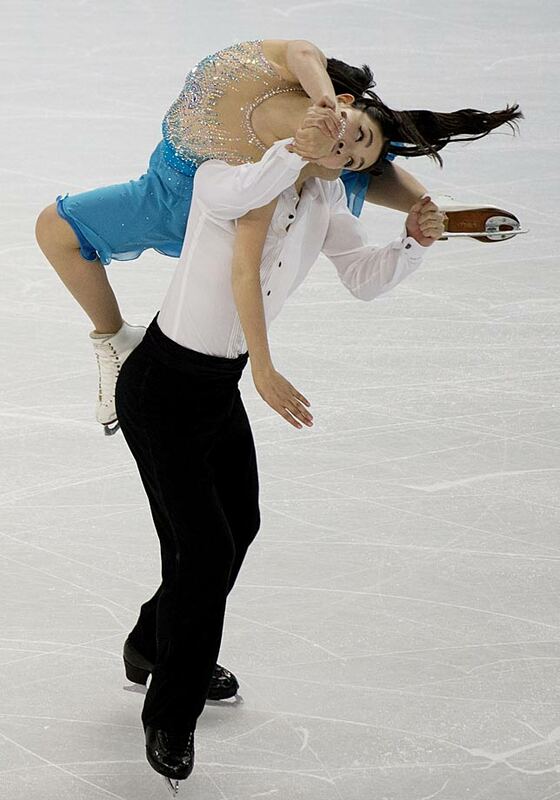 Isabella Tobias and Deividas Stagniunas of Lithuania compete in the short dance figure skating competition. 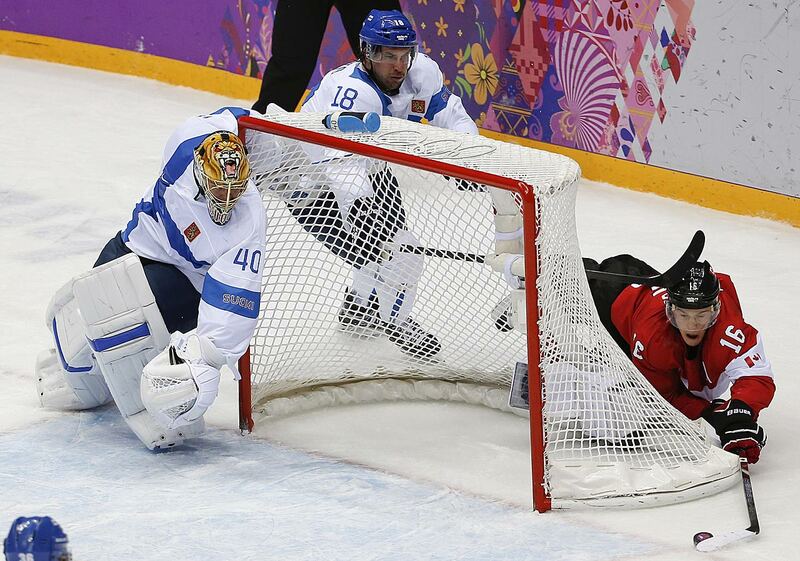 Kaitlyn Weaver and Andrew Poje of Canada compete in the short dance figure skating. 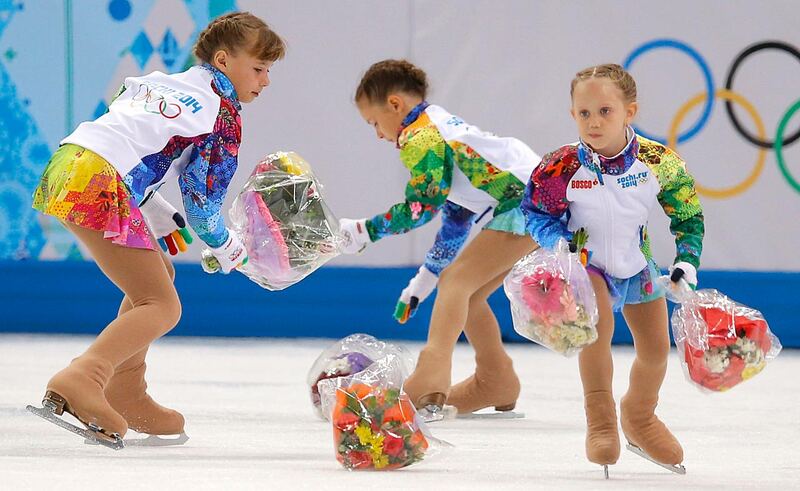 Flower girls pick up bouquets thrown on to the ice by spectators following the routine by Ekaterina Bobrova and Dmitri Soloviev of Russia. 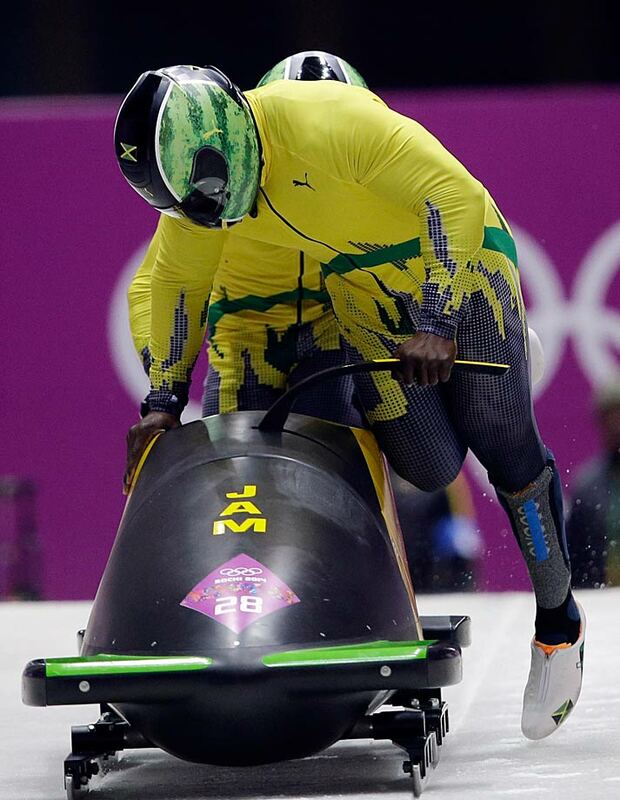 The team from Jamaica, piloted by Winston Watts and brakeman Marvin Dixon, start their first run during the men's two-man bobsled competition. 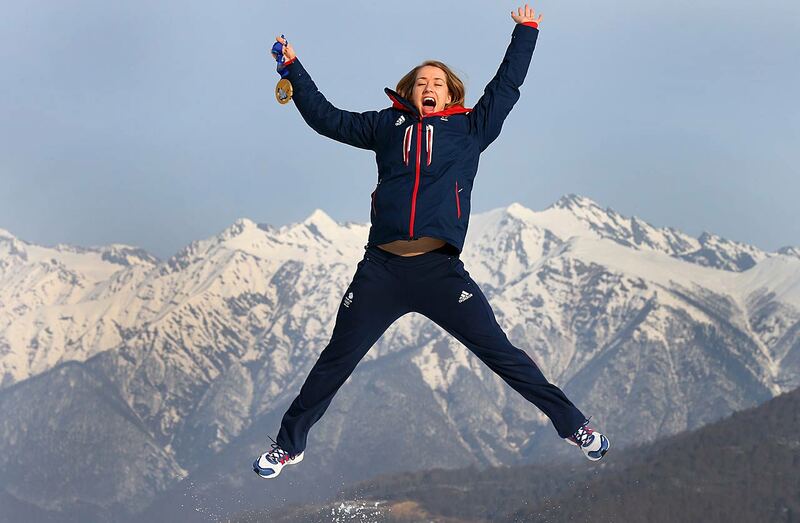 Lizzy Yarnold of Great Britain jumps holding her gold medal after winning the Skelton.